Just about every region that is touching the sea in Italy (fifteen out of twenty regions!) has a rendition of a seafood sauce to dress a quick plate of pasta. This recipe is from the region of Calabria, which has quite a bit of coast to fish upon, and where the best spicy pasta in Italy can be found. I visited Calabria during my travels for Lidia Cooks from the Heart of Italy, and was so happy to bring this dish back with me as a souvenir. To prepare the seafood: Cut the calamari bodies, including the tentacles, into ½-inch rings. Pull off the side muscle or “foot” from the scallops and discard. Remove the shells, tails, and digestive veins from the shrimp; rinse and pat dry. Heat the olive oil in a skillet set it over medium-high heat. Scatter in the sliced garlic and cook, stirring occasionally, until it begins to sizzle and color, about 1 to 2 minutes. Dump in the cherry tomatoes, sprinkle on the teaspoon salt and the peperoncino, and cook for about 5 minutes, stirring and tossing the tomatoes , until softened and sizzling in their juices but still intact. Start cooking the pasta first and the seafood right after, so they are ready at the same time. Drop the spaghetti into the boiling water, stir, and return the water to a boil. As it cooks, scatter the calamari rings and tentacles in the pan with the tomatoes, and get them sizzling over medium-high heat. Let the pieces cook for a minute or two, then toss in the scallops, and spread them out to heat and start sizzling quickly. After they’ve cooked for a couple of minutes, toss in the shrimp, ladle in a cup of boiling pasta water, stir the seafood and sauce together, bring to a steady simmer, and cook just until the shrimp turn pink and begin to curl, about 3 minutes. As soon as the spaghetti is barely al dente, lift it from the pot, drain briefly, and drop into the skillet. Toss the pasta and the simmering sauce together for a minute or two, until the spaghetti is nicely coated with sauce and perfectly al dente, and the seafood is distributed throughout the pasta. Turn off the heat, sprinkle on the basil and parsley, and drizzle on another 2 tablespoons olive oil. 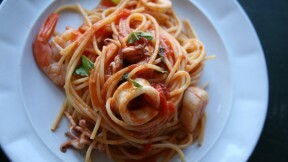 Toss well, heap the spaghetti into warm bowls, giving each portion plenty of seafood, and serve immediately.